unless you go real close and peer over its rim. at the tail end, the zipper tape emerges from the end of the panel, then dips into the space/gap between the end of the panel and the bag. 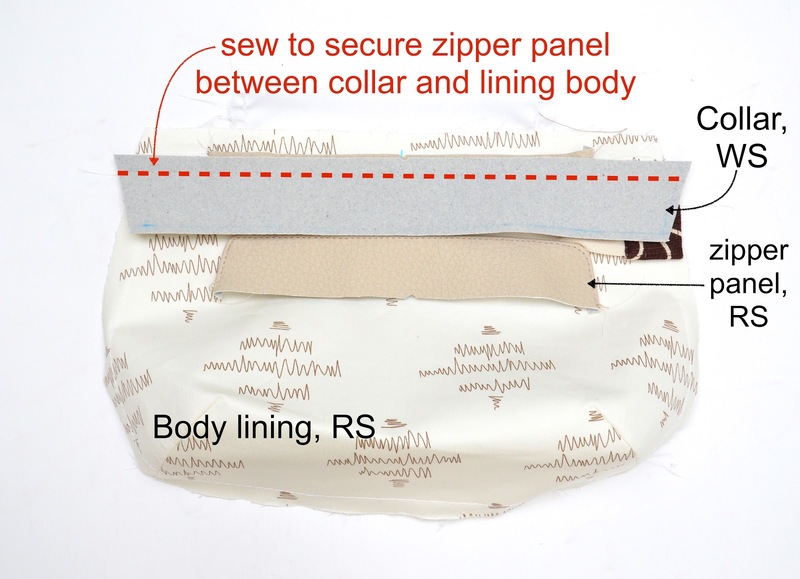 This is not the only way to make a recessed zipper panel - mine has curved ends, for instance, but you can make yours with straight ends and sharp corners. 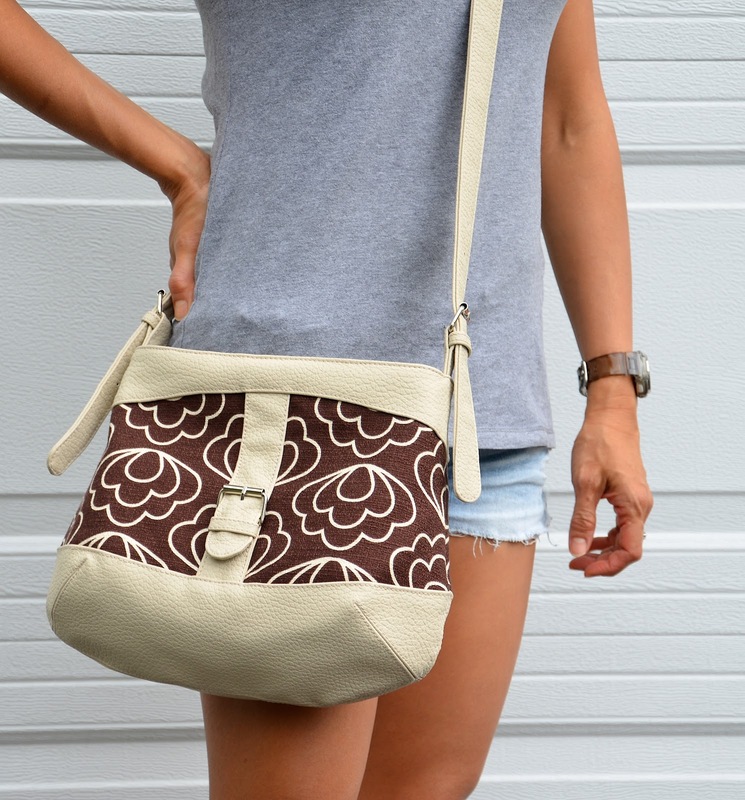 And if you'd left a smaller space/gap between panel and main body, you'd have a boxier-shaped bag overall. So, lots of design choices, but today we'll focus just on the basic structure of a recessed zippered panel. 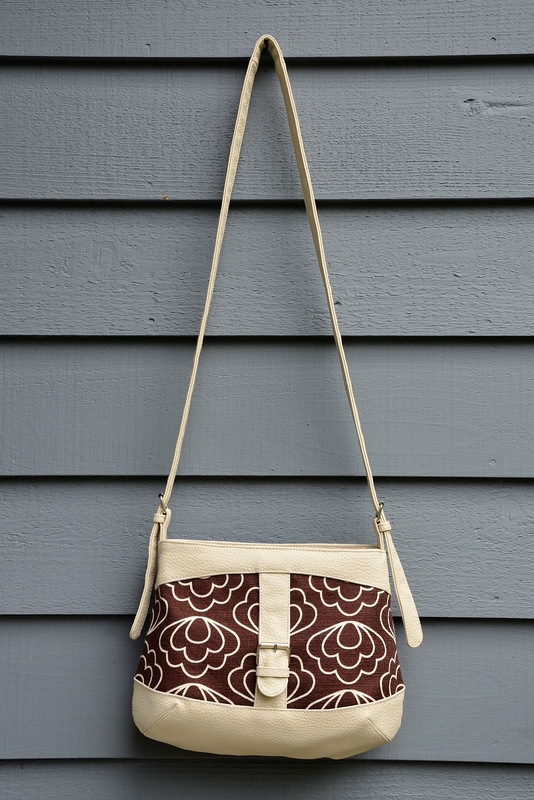 Let me just confess outright that this is the first bag I have ever made with a recessed zipper panel. 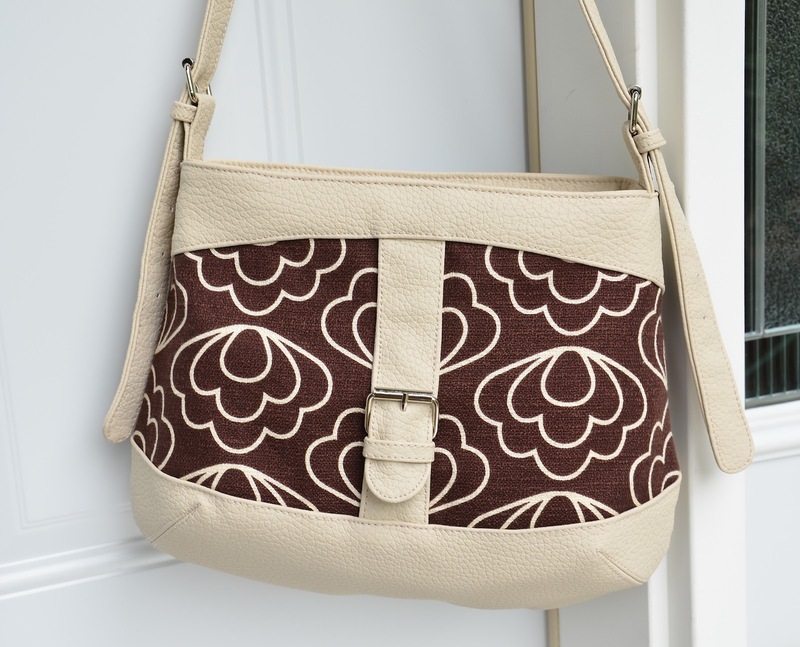 I think the reason for my never having made one in the past is that they tend to characterize handbags, which I don't use a lot of. 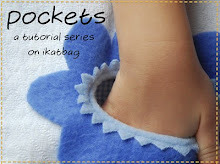 For the sake of this series, however, I made you guys a Recessed Zipper Handbag (you're welcome!) just to show you how easy it is. Incidentally, that recessed zipper is not the only zipper in this bag. 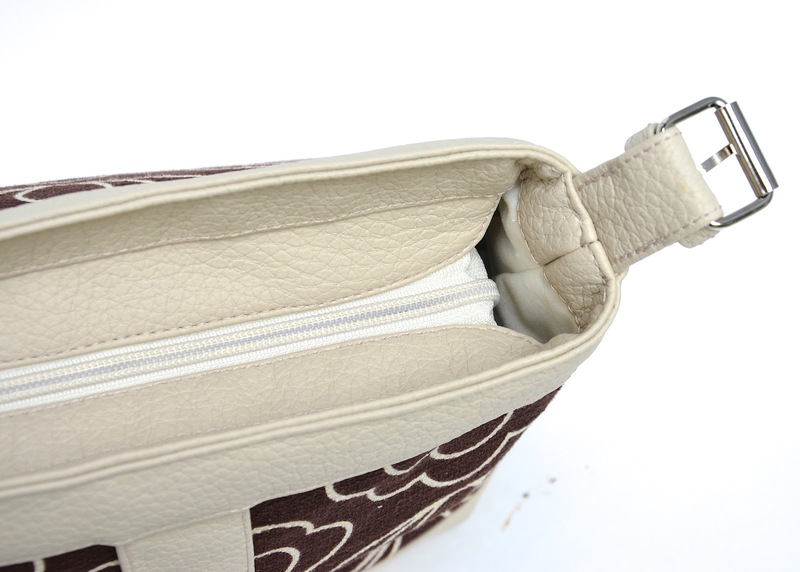 There is another zipper on the inside - for a zippered welt pocket. Here it is again, in a lining-side-out shot. 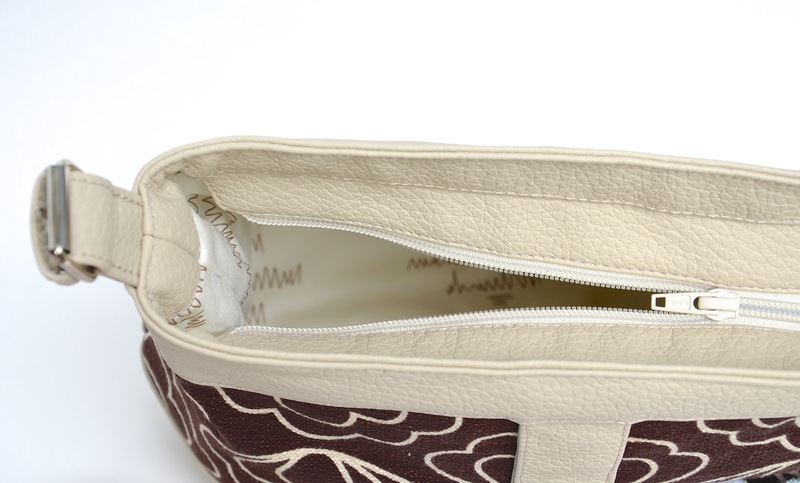 You can also see how the recessed zipper panel looks on the inside of the bag (which has been turned inside out). Enough show-and-tell; let's get to work! 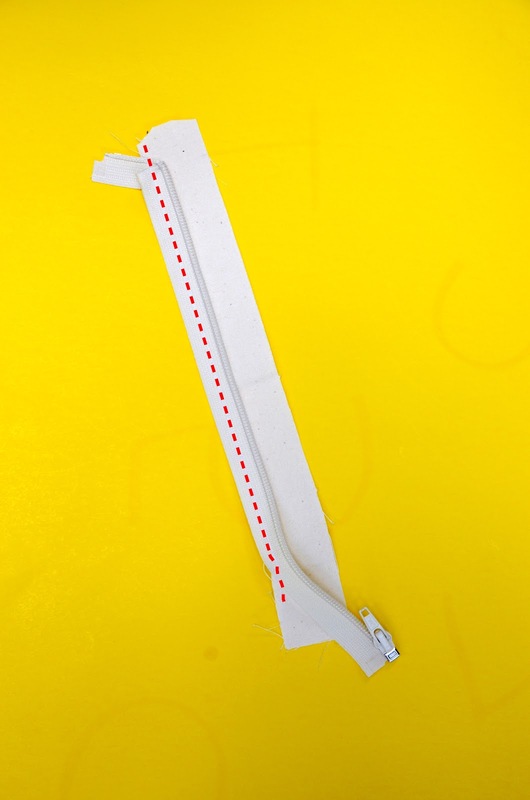 This is the schematic layout of the zipper on the fabric strips. Begin by laying the lining strips RS up on your work surface. 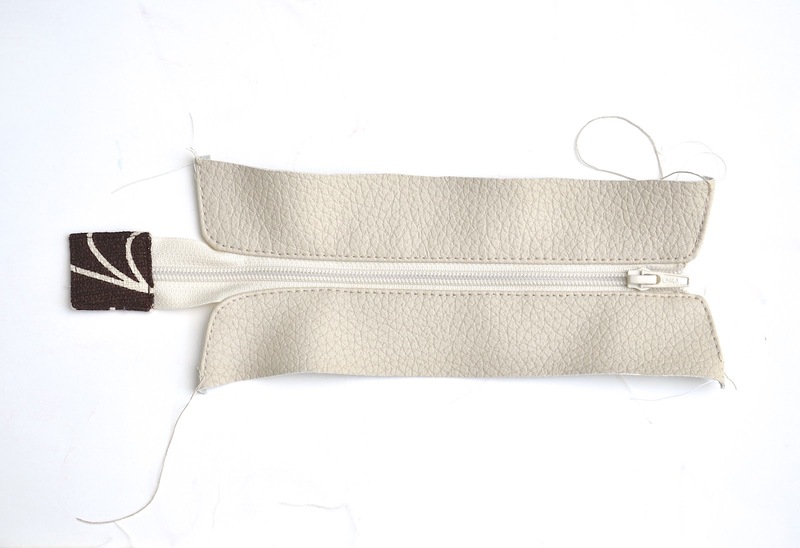 Lay the zipper tape on top of them so the WS of the zipper touches the fabric and the smooth edge of the zipper tape lines up with the outer edge of the fabric. 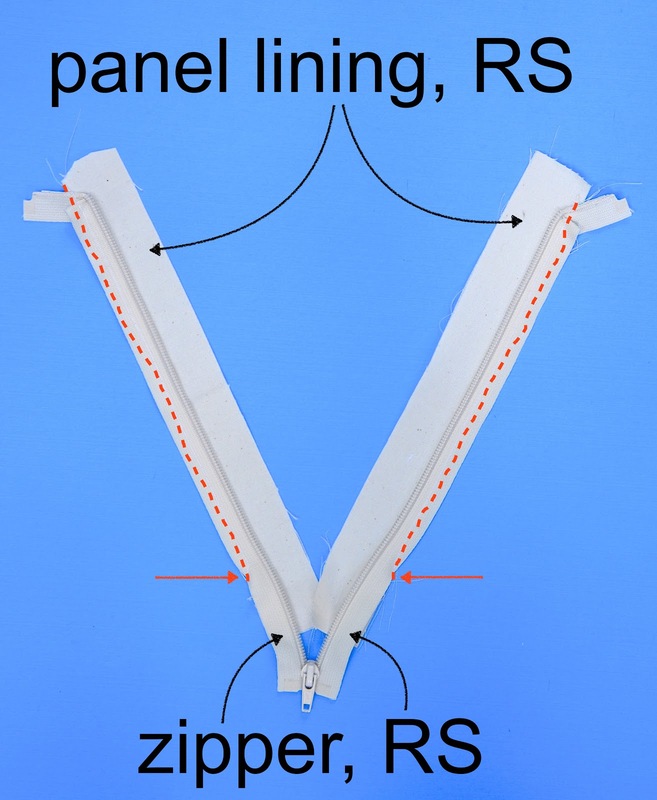 Band and fold the head ends of the zipper tape into the SA region (i.e. away from the coils), as shown. Baste to attach (see the red dashed line). 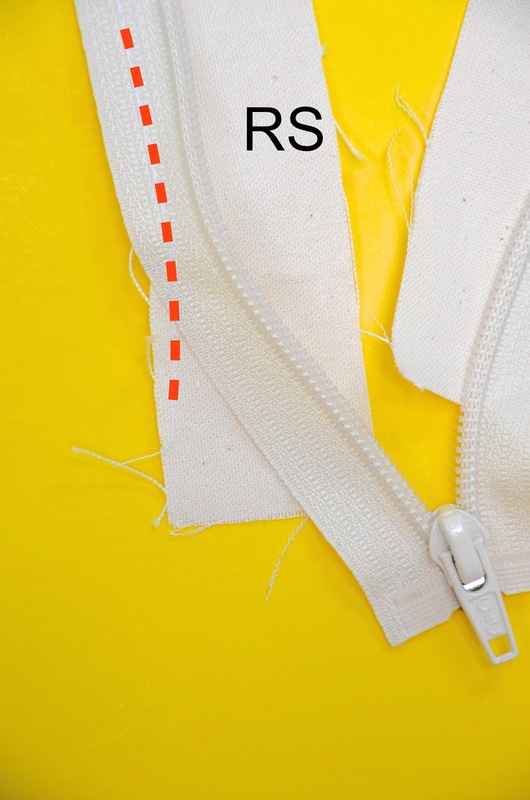 Pay attention to how you'll stitch toward the tail end of the zipper panel (see red arrows above) - we will need to manipulate the zipper tape a little here. More details to follow two photos down. 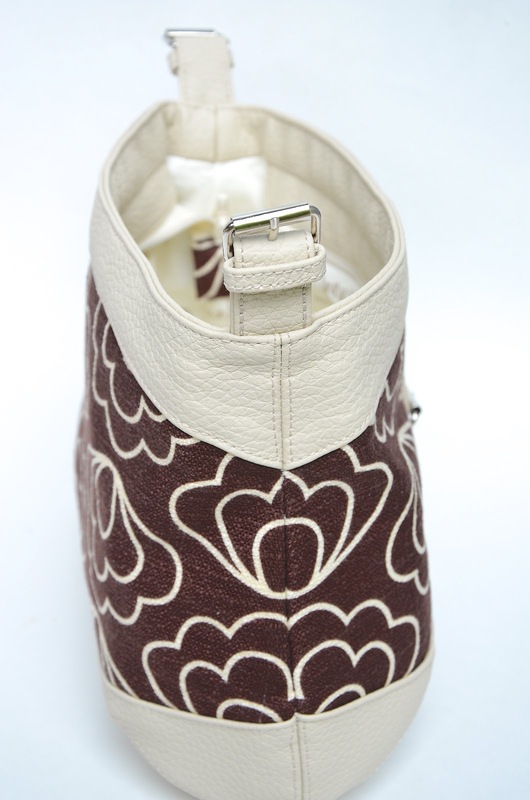 Here is a close-up of the head end of the zipper. Just baste straight through the bent top portion. And here is the tail end - notice that it bends in the opposite direction from the head end - away from the SA region. Baste right across that careening bit of zipper tape, and run your stitches off to the side. 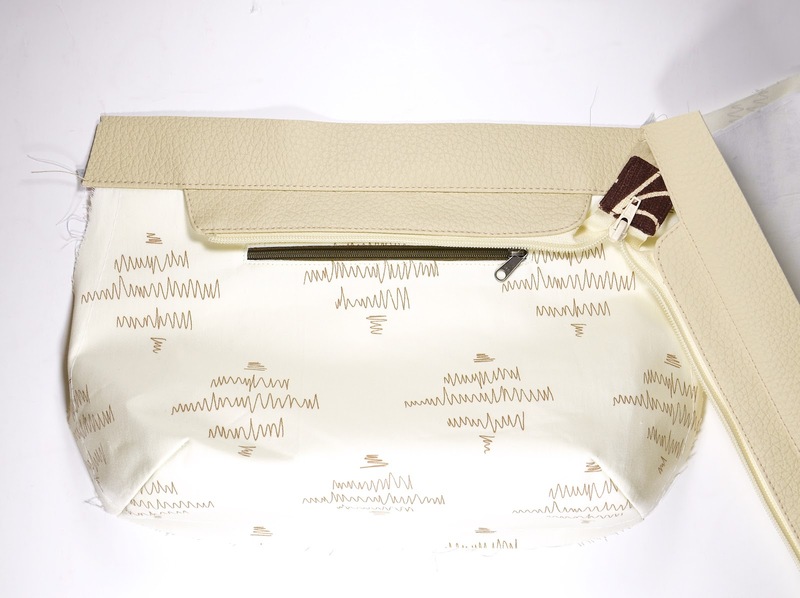 Here's what the whole thing looks like - I've separated the zipper tape into halves; this is the "left" half. Now, add the outer fabric strips, RS down, so the RS of the lining and outer strips are together, with the zipper between them. There is no reason for why my fabric strips are pointy towards the end - they were probably remnant shapes left over after cutting out other parts of the bag. 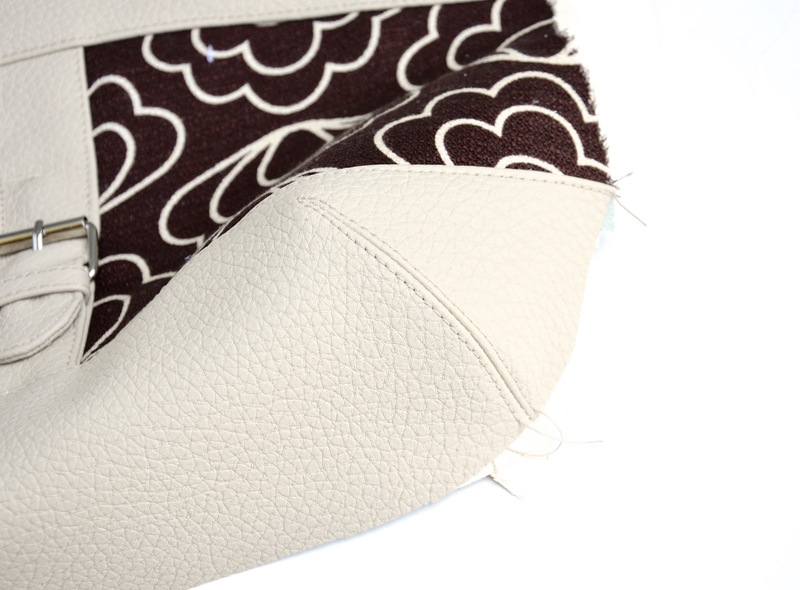 Note the red stitching line now - this is how you will be sewing the two layers together. 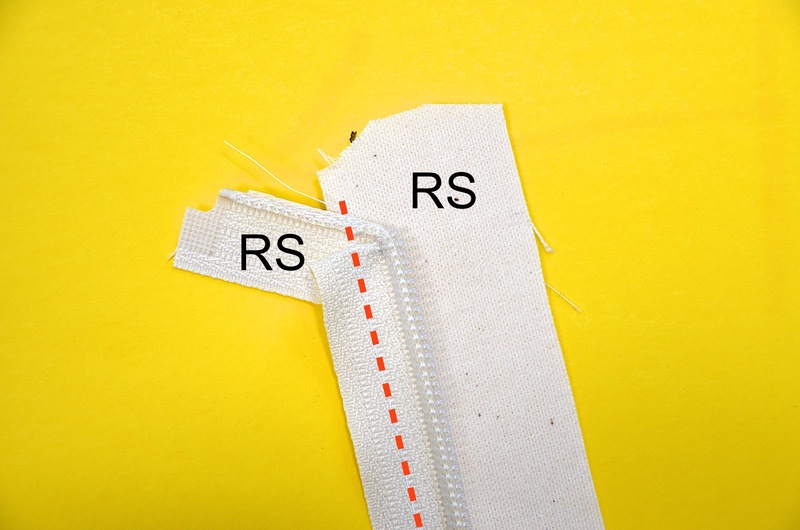 Here is that same photo again, showing you the mirror-image stitching on the other side of the zipper tape, peeled back to help you visualize what we're doing in relation to the zipper coils. We are making a sandwich, from whose edge the zipper coils are going to emerge. 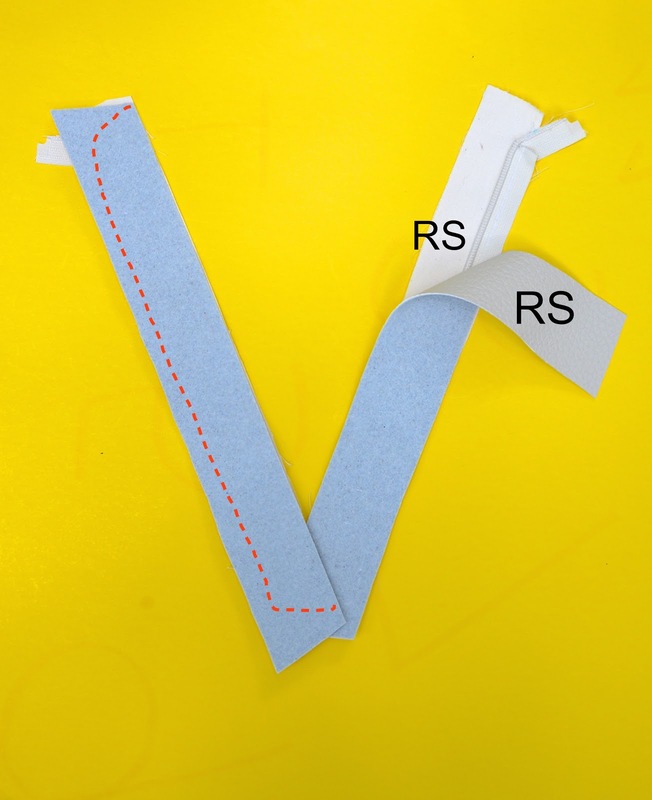 In the next photo are the two halves of the zipper tape, separated so you can more easily see their orientation with respect to the fabric strips. 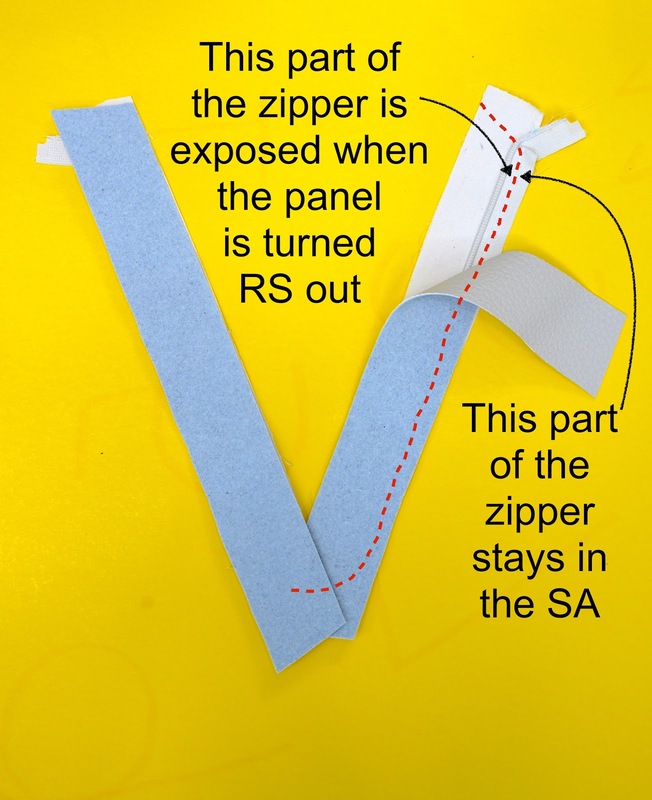 The right half shows our goal: to make a panel which exposes the zipper coils but encloses the SA of the zipper tape, AND absorbs the head end of the zipper tape while allowing the tail end to stick out so we can more fully unzip the whole thing. 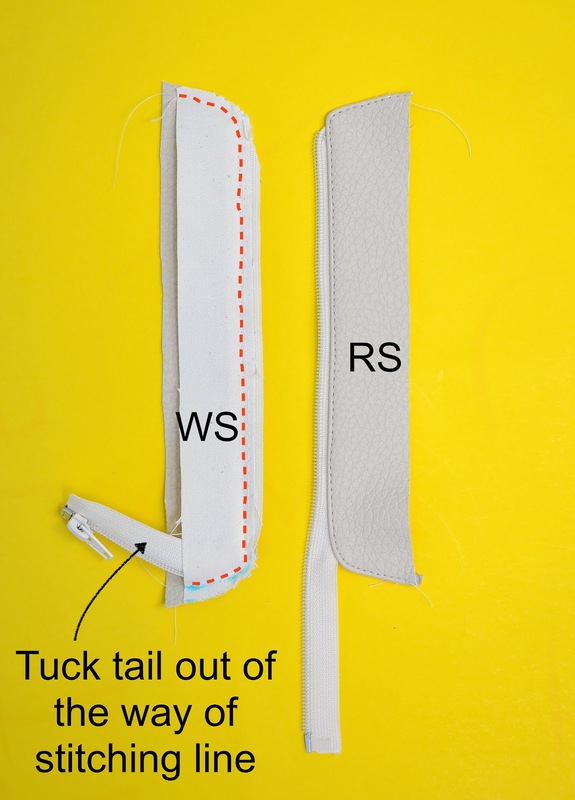 The left half shows how we'll need to stitch those two fabric layers together to secure the various parts of the zipper tape - the head end is tucked in and sewn right across; the tail end is shoved out of the way of the stitches so that, un-trapped, it can peek out later. Here is the completed zipper panel. You can leave the panel as is, or properly finish that tail end of the zipper. I shortened the tail and enclosed the raw end in a fabric tab. 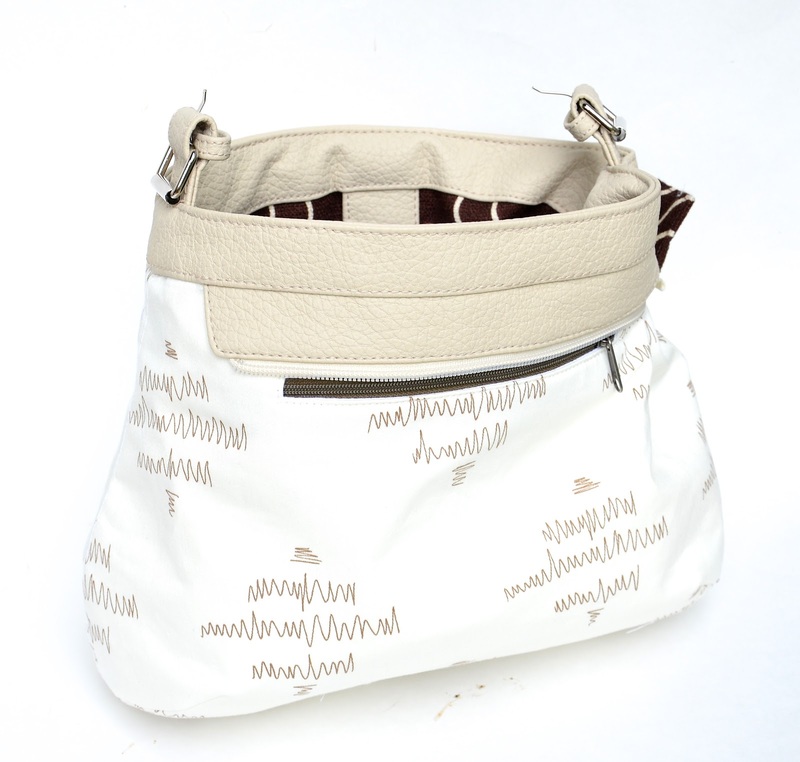 Set the zipper panel aside and make the bag body. and the back does not. 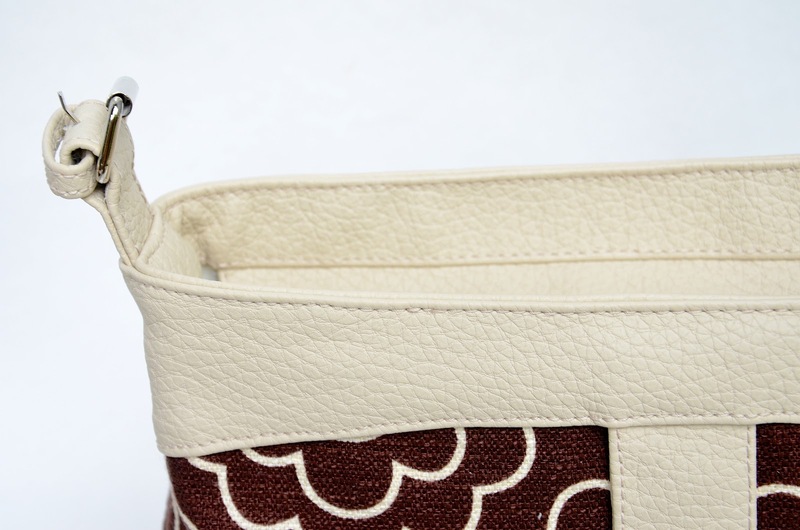 The bottom corners of the bag are darted (and topstitched, for texture). The two halves of the outer body are left separate. 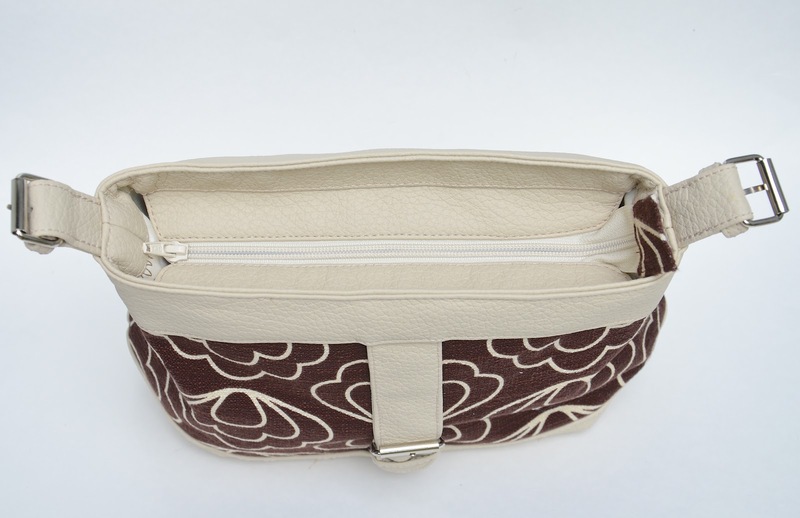 The lining is of the same shape and size as the outer body, but with organizational features, like internal pockets. My bag, as earlier mentioned, has a zippered welt pocket. The two halves of the lining body are left separate. Let's first look at the layout, so we know what goes where. Here are the pieces that will comprise one HALF of the finished bag: one outer back body piece, one lining body piece and an additional strip of fabric (I used vinyl) that forms a kind of yoke, or "collar" around the top of the lining body. 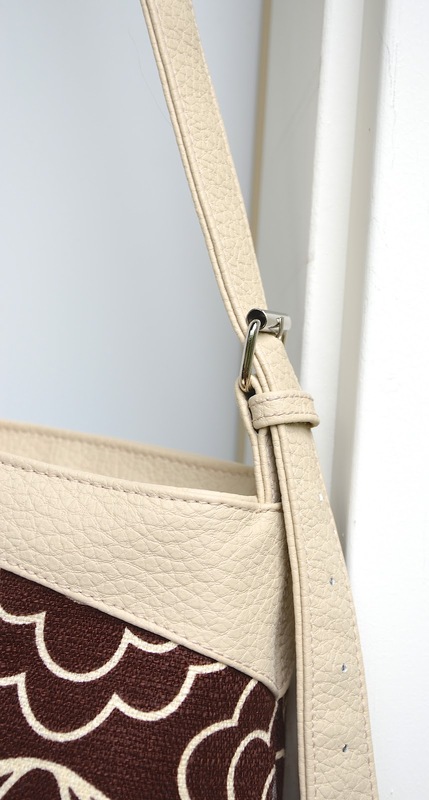 This "collar" provides a seam a few inches below the actual top edge of the bag, into which the zipper panel can be inserted, thus "recessing" it. That collar seam-line is marked on the lining body in light blue. Lay the zipper panel RS up on the body lining. 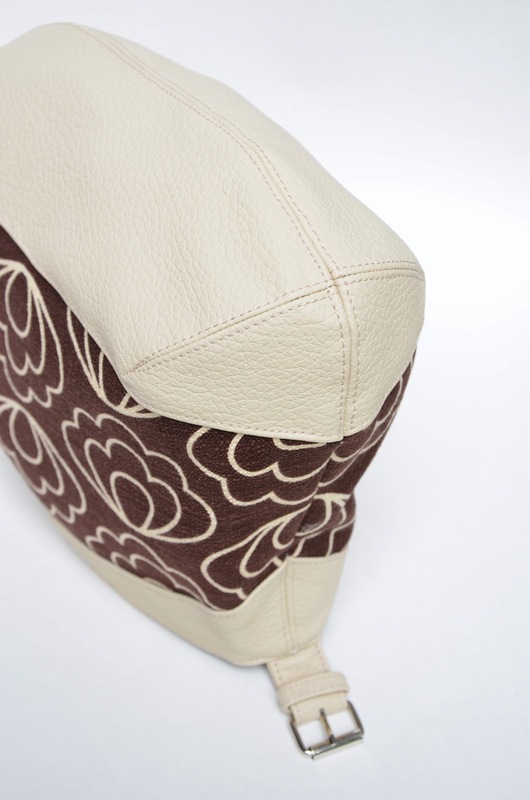 Line up the stitching line of the zipper panel with the collar seam on the body lining piece. Then lay the collar itself on top, RS down and upside down, as shown. Line up its stitching line with the other stitching lines, and sew to secure the zipper panel between the collar and the lining body. Here is what it looks like with the collar flipped up. You can see the zipper panel inserted into that collar seam, and centrally-situated. 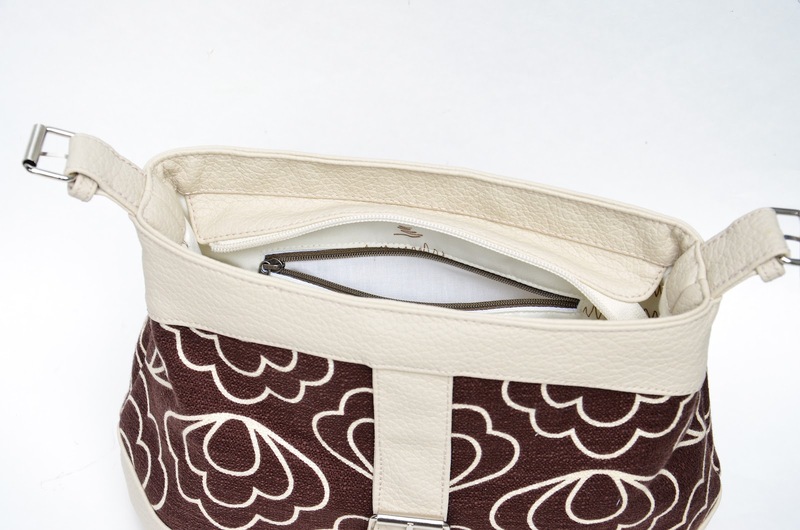 Notice that the zipper panel is quite a bit shorted than the width of the lining body piece. 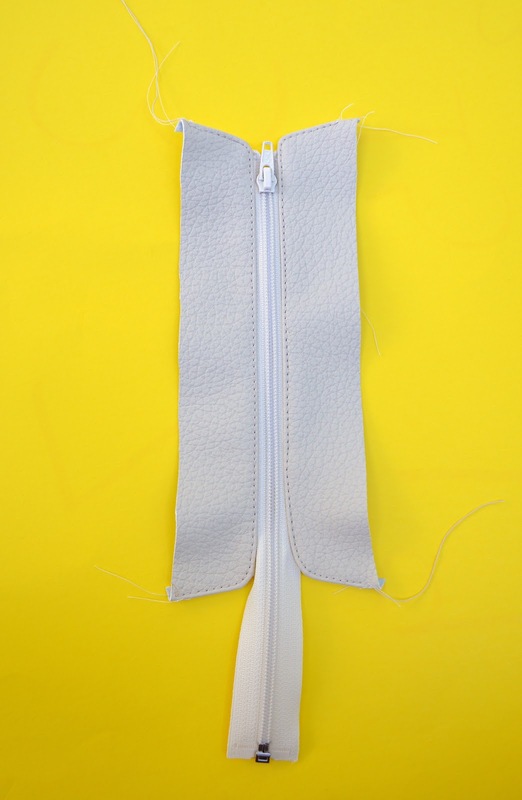 That extra width on either side will be folded around the ends of the zipper panel to create a depth/thickness. 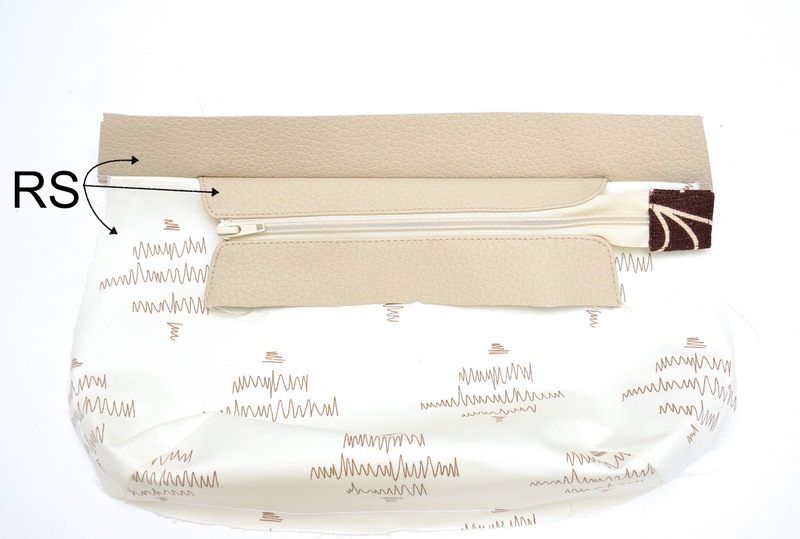 Remember: this is not a flat tote! 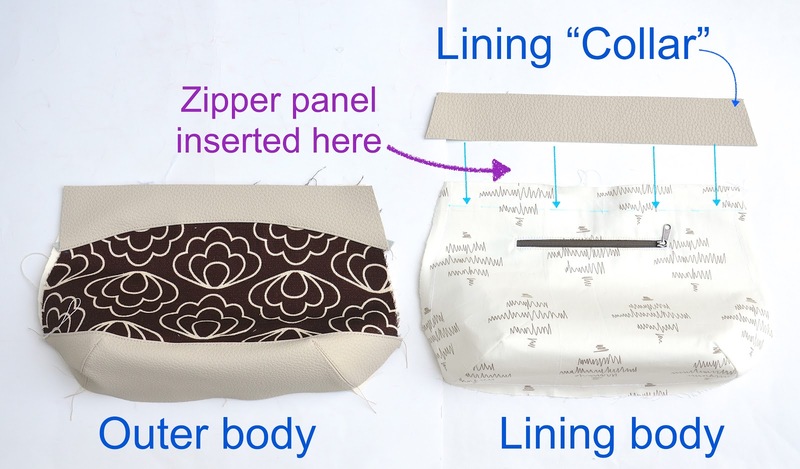 Now repeat this process to attach the other side of the zipper panel to the other outer body piece and the other lining body piece. I find it easier to do so if the zipper is fully unzipped. Topstitch (or edge-stitch) on the collar, along that collar seam, if desired. 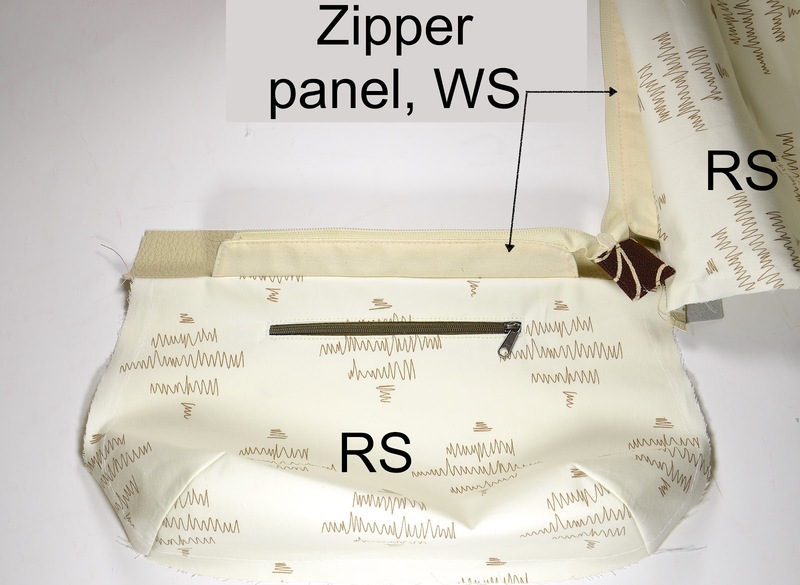 Here is the underside (WS) of the zipper panel, with the zipper still open. 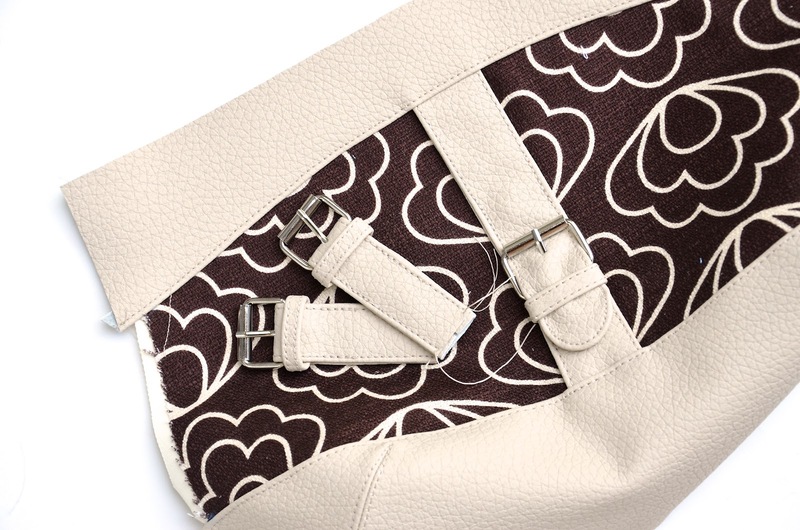 When you close the zipper, the two halves of the bag lining are brought together. This is the view of the underside (WS) of the zipper panel. Step 5: Complete the outer bag and bag lining. 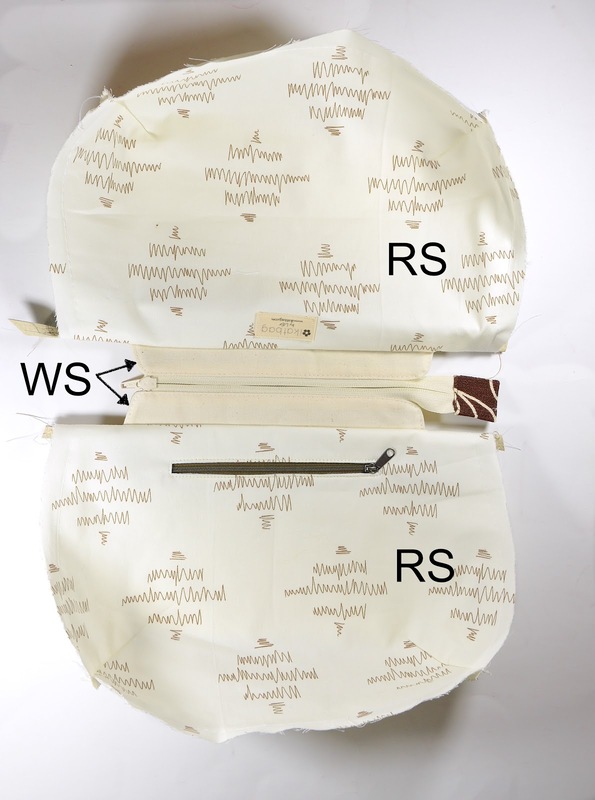 Bring the RS of the bag lining halves together (see photo immediately above) and sew around their sides and bottom to finish the bag lining. Repeat with the outer bag halves to finish the outer bag. In the photo below, you can see this bottom-and-sides seam. Ignore the strap anchors - they will be inserted in the next stage. 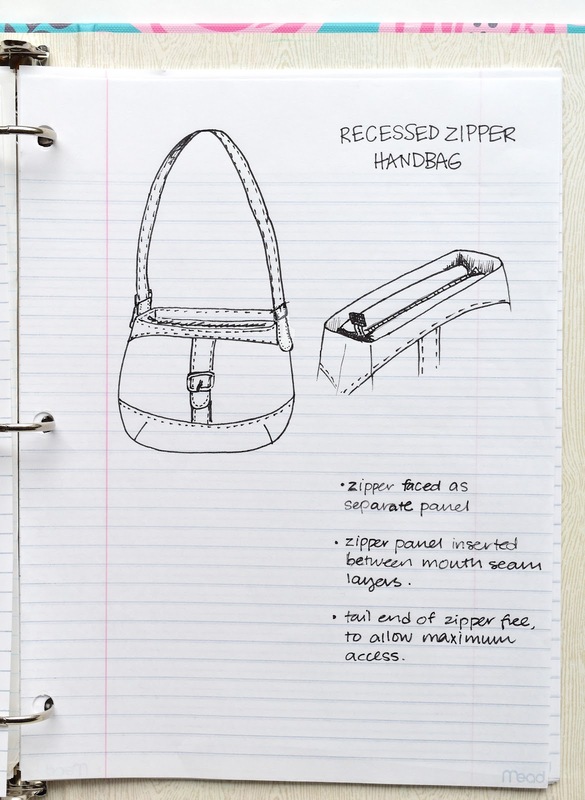 You will now have two separate bags - one outer and one lining, which has the recessed zipper panel attached to it. Stage 6: Connect the two layers (outer and lining) around their top edge. 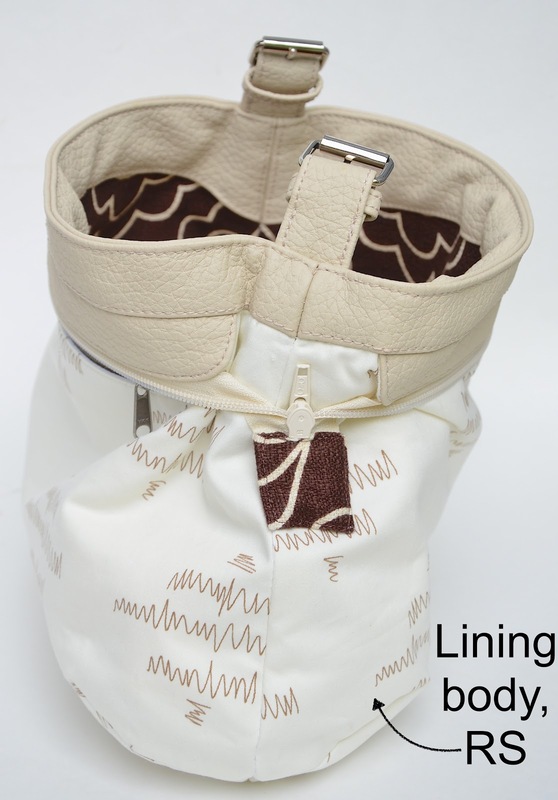 This method does not require leaving a gap in a lining seam for turning the entire bag inside out. 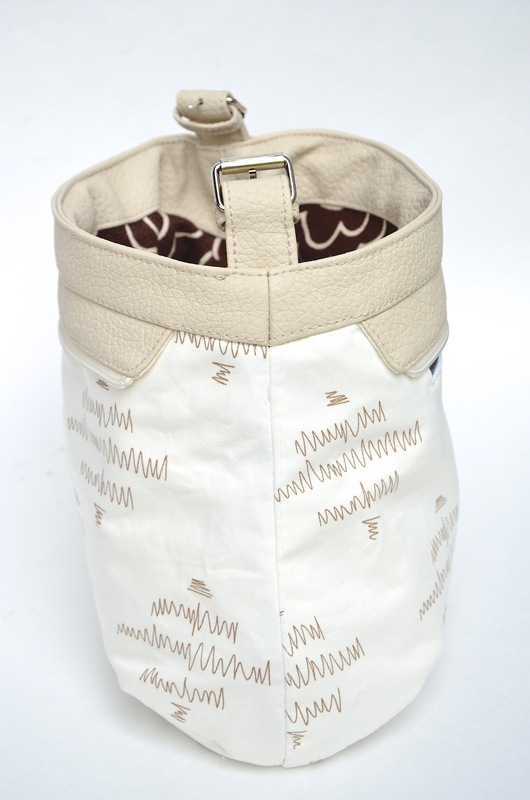 The lining bag is inserted into the outer bag with their WS together. 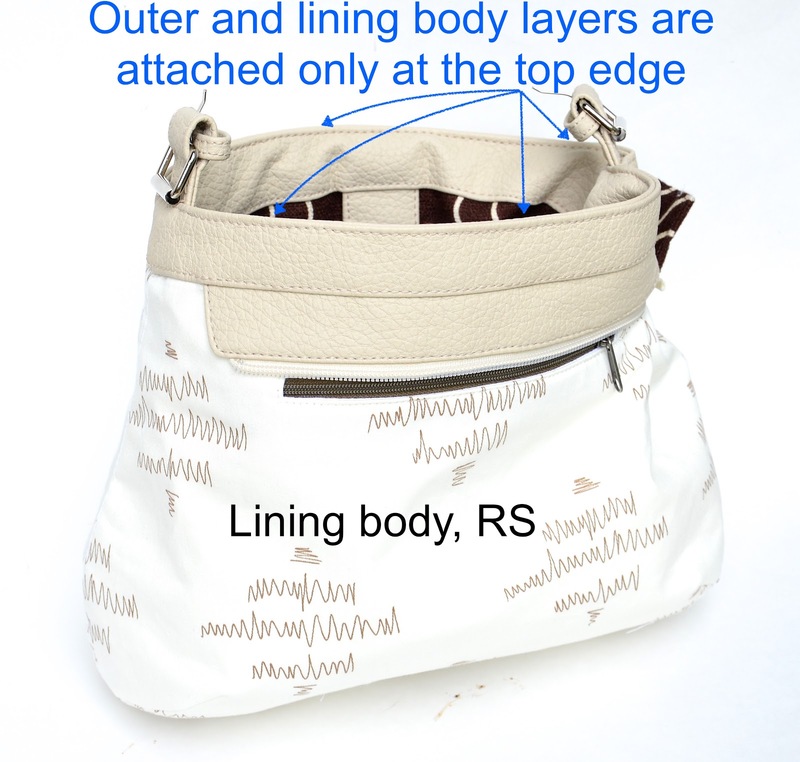 The SAs of the top edge are then folded down to the RS and the two layers (outer and lining) are top-stitched together, finishing the bag. Which is my acronym for "Turn The Whole Bag RS Out Through A Hole In The Lining". 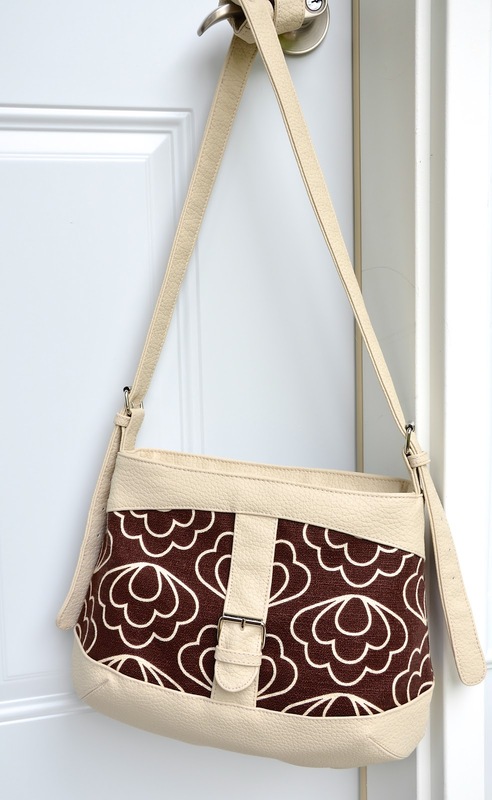 This is a very popular method, particularly for bags and pouches that utilize thin, light-weight, uncrushable fabrics. Essentially, you attach the outer and lining layers, placed RS together, around their top edge, having earlier left a gap in a lining seam. 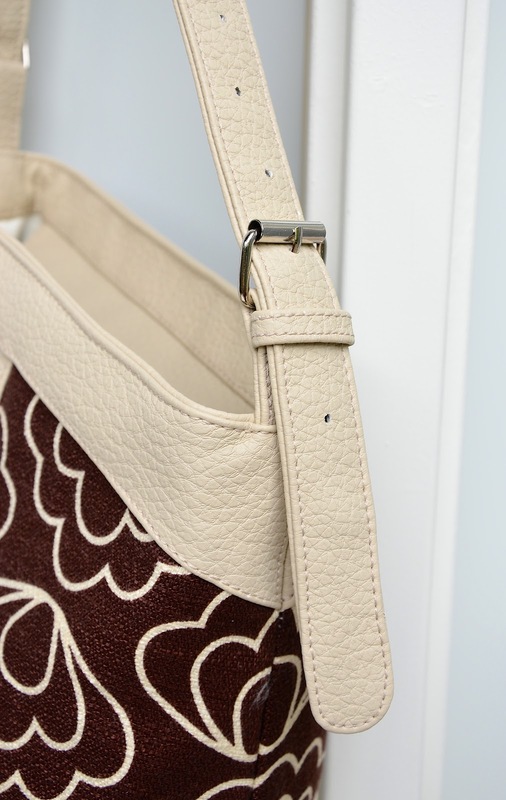 Then you turn the entire bag RS out through that gap, and hand-stitch shut the gap after. 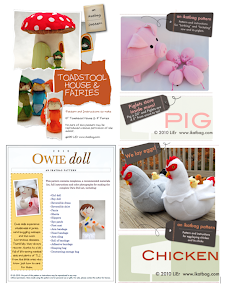 You can see examples of these two methods in this post from my earlier Make A Bag series. I used the first method on today's bag, inserting the strap anchors at either end as I edge-stitched the layers together. If you are using thick fabrics, and several layers of them, as I did, your machine might protest, in spite of employing the right tension and correct needles and so on. I found, for instance, that my machine produced weird stitches at the insertion point of the strap anchor, and no wonder - it did not care for sewing through a stack of 8 layers of vinyl+twill+stabilizer. So I machine-stitched only up to the "hump", and hand-stitched through the hump itself. And this is the view from the top, showing how the side seams of the bag actually hug the ends of the panel pretty closely - remember how we talked about the thickness of the bag and how the panel had to be considerably shorter to accommodate that? I made a closed strap with rounded ends, and holes punched in either end to accommodate the prongs of the buckles on the strap anchors. Here is a side shot of the buckle mechanism, to help you visualize how it all works, and so you'll be able to reproduce it at home. 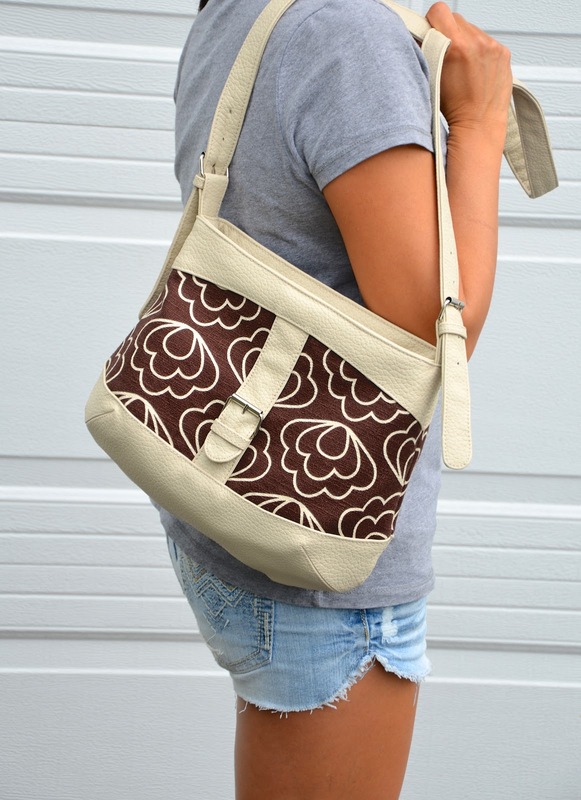 Surprisingly, in spite of it being a handbag, I really liked how this bag turned out. I think it's the combination of that barkcloth* and the vinyl. 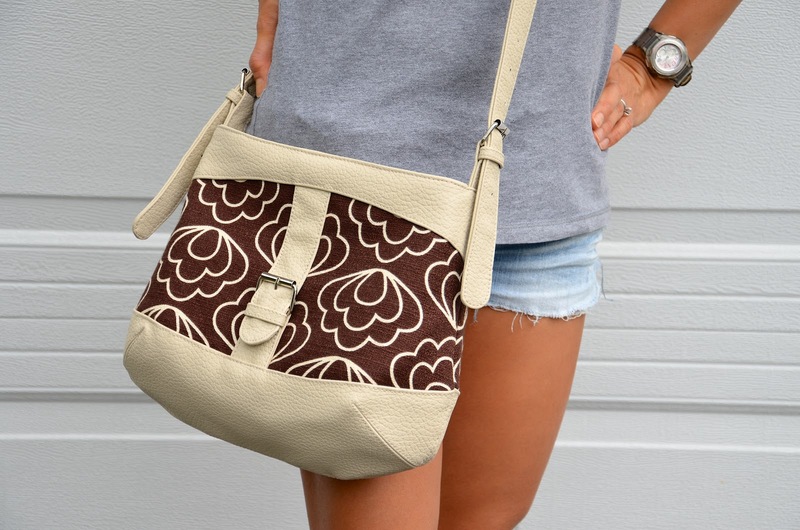 And the fact that I can carry it cross-body so it feels more like a satchel than high-fashion purse. Hurrah! 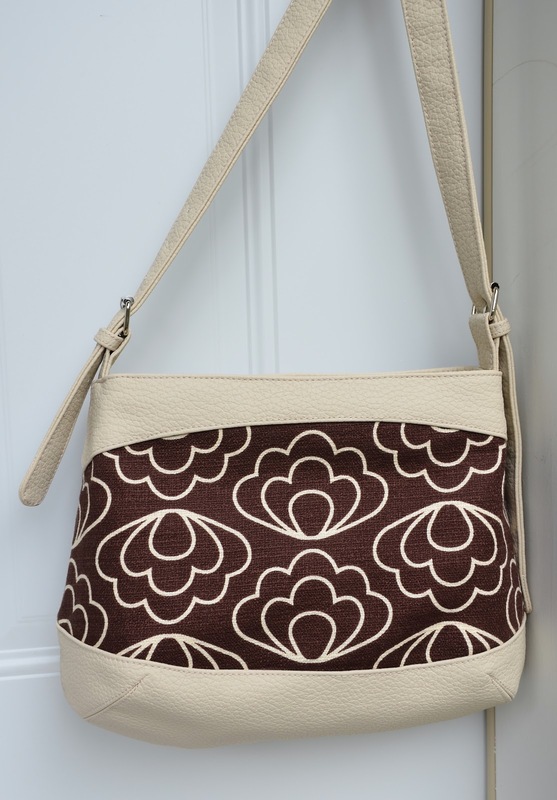 * Jessica Jones' Timewarp barkcloth in Brown Ripple, by Cloud9 Fabrics. Wow, the amount of information and detail you have provided in this whole series is astonishing. Thank you, thank you - what a valuable reference. owesome...n thank you for the information detail..
Beautiful bag and I love the detail. The detail in this bag is what makes it look professional. Gracias, gracias, gracias y gracias!!!! You change my life, over and over and over!! Thank you for sharing your knowledge, you explain things better than anyone else online.